Unless otherwise noted, meetings start at 6:30 pm for social time with the formal program beginning at 7:00 pm. Meetings are usually the second Tuesday of the month at the the First Baptist Church of Olympia. You need not be a paid member to attend your first meeting. Meetings begin with social time which allows members to meet with one another, check out items from our extensive library, and look over the wide assortment of wood and projects that are brought in on display. At 7:00 we begin our wood raffle, which for one dollar, members and guests get a chance to win any number of pieces of wood suitable for turning. 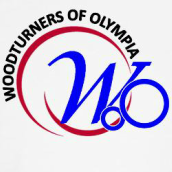 All of the wood is donated by other members, and proceeds go to the Woodturners of Olympia to pay operational costs to hold the meetings. We also collect donations to the food bank. After the wood raffle members and guests can participate in a show and tell, where they can display and talk about projects they have created. Google Map – to the First Baptist Church. For details on this month's meeting - click here!